knowing full well that members of National Youth Service Corps (NYSC) would be involved in 2019 general elections, Kaduna State Governor, Nasiru El-Rufai on Monday called on corps members not to compromise the integrity of the scheme during the period. 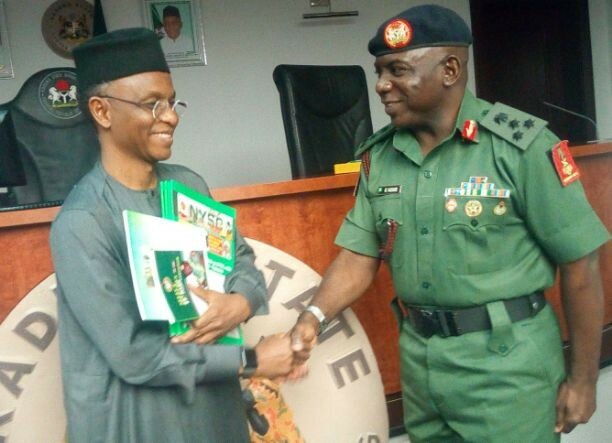 El-Rufai, who made the call while declaring the 21-day joint orientation course for Batch B Stream II corps members deployed to Kaduna, Niger and Kogi states closed said, their unalloyed commitment to the nation would be required during the elections, hence the need for the early warning. Represented by the Permanent Secretary, Ministry of Youth, Sport and Culture, Musa Adamu, the governor said the corps members would play “vital roles in the 2019 general elections and as such they must live above board and acquaint themselves with all the rules and guidelines guiding election conduct in the country so the image of the scheme can be maintained. He then assured corps members of their security and enabling environment wherever they may be posted to, urging them to receive their posting letters in good fate and settle down quickly for the one year mandatory service to motherland. In an interview with newsmen, the Director General of NYSC, Brig. Gen. Sulaiman Kazaure restated that, the joint orientation course across the country was due to few number of corps members mobilised for the scheme and to save cost. The number one corps member in the country added that, the scheme has introduced skills acquisition and entrepreneurial development programmes to enable corps members acquire necessary skills to live productive life without waiting for jobs even before they finish the service quickly added that, a lot of them are already creating employment for others. He added that, the idea of making corps members self-reliant was to compliment the efforts of the Federal government in tackling the issue of unemployment in the country. On the delay experienced in the payment of corps members’ allowances, the director general attributed it to “a change on the payment platform which has been addressed”.